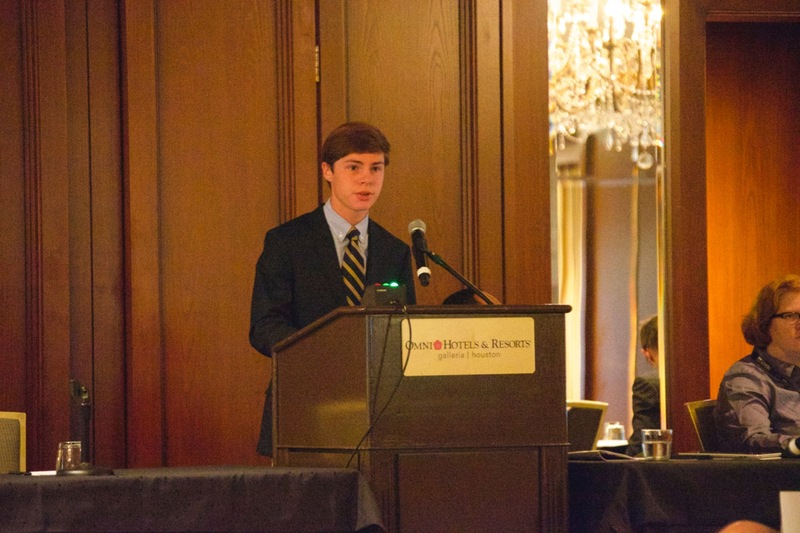 Speaking before a room of roughly 200 of the country’s best cancer surgeons, Chapman Caddell, a junior at Stevenson School, had the unprecedented opportunity as a high school student to present at the national Musculoskeletal Tumor Society’s Annual Meeting last month. While interning at the world-renowned MD Anderson (MDA) Cancer Center in Houston, Texas in 2013, Chap attended multiple surgeries and clinics every week, and commenced research regarding the best surgical approach to address metastatic femur fractures as a consequence of metastatic renal cell carcinoma. Following his retrospective analysis of more than 10 years of surgical records and follow-up for 56 patients, Chapman took the lead in drafting a paper summarizing the results and proposing the best surgical method. In early 2014, Chapman completed the paper, entitled The Treatment of Diaphyseal Femur Fractures in the Metastatic Renal Cell Carcinoma. The paper, co-written with MD Anderson Chief Orthopaedic Surgeon, Dr. Valerae Lewis, and several other MDA surgeons, was submitted for podium presentation to the 2014 Musculoskeletal Tumor Society’s (MSTS) Annual Meeting. This spring, Chapman learned that out of 160 abstracts, his paper was one of 30 selected for podium presentation. And last month, Chapman delivered his team’s presentation at the 2014 National MSTS Annual Meeting — and underwent questioning on the dais. According to Dr. Lewis, while it was probably the first time a 16-year old had ever made a podium presentation at a national surgical conference, Chapman’s presentation and handling of difficult questions were excellent. “Chapman did an excellent job working with the Department of Orthopedic Oncology at M.D. Anderson. It was commented that his composure and maturity far exceeded his chronologic age. His intelligence and hard work was noted by several of the faculty members with whom he had the opportunity to work. Not only was his presentation well received, but he did an excellent job of fielding questions from the audience,” said Dr. Lewis.